I know I spent my last post kind of whining about the work there was to do yet. Sometimes I wonder if I have a little adult onset attention deficit disorder. The truth is I like to look like I'm making progress even to myself, and just knowing it sometimes isn't good enough, I have to see it. The night after I made the post I had a little revelation that helped spur me back to work. Recently I have had the good fortune to find some seasons of the old sci-fi TV show "Babylon 5" at Wally World. I loved this show in syndication and is one of the only TV shows in my life I have ever made it a point to pay attention to watch. It was just a cut above most sci-fi shows, (including imho star trek) because the storyline was so well developed and it played the politics of a future in space with other species so well. If you have never seen it I know you can see episodes on Hulu here. Anyhow, not to get into things very deep at all, but at one point an alien ambassador gave some advice to another of the shows main characters, and I fell in love with the line, it went something like this. "After the avalanche starts, it is too late for the pebbles to vote." I know very Confucius. This line kind of stuck in my head the last few days, I know an avalanche can start with just the mere shifting of a few pebbles, but once the course of one is set, there is no denying or turning back, no staying put on top of the mountain. You can resist in futility, or you can go with the flow. Although the analogy is not perfectly clean, and I have never really considered my projects to be an avalanche. Sometimes they do take on a life of their own and represent themselves as bigger than their initial intentions. I will think of this line from time to time when this happens, and remind myself that I was the pebble that started the slide, I should settle down and enjoy the ride. Speaking of the ride itself, I did manage to finishing sharpening the saws that I have named the 4 Brothers. but speaking of the avalanche, I have also decided now that I cannot abide by the plastic handle on the one Disston Crosscut. 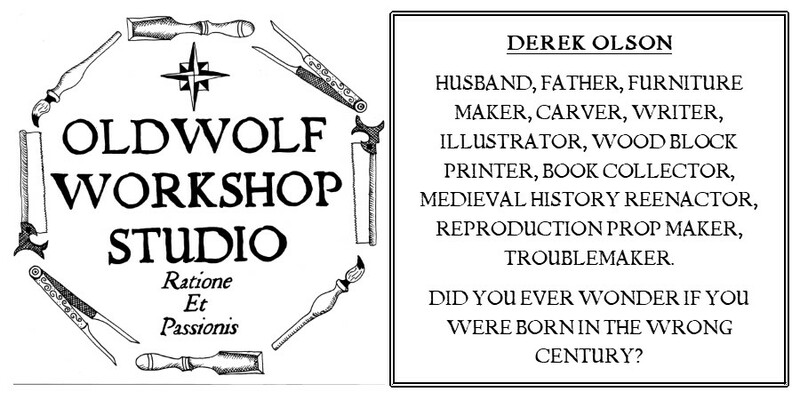 The very next thing I do will be to make a wooden handle for him. Again speaking for the ride itself, I received what may be my last plane purchase for a while two days ago. A vintage wooden German make horned plane I plan to use it for a scrub plane. Last night I took the time to scour the rust from the plane blade and chipbreaker and to sharpen and hone the blades. I took it for a test drive on a short piece of 2x4 . . . in less than 2 minutes of very light work, I had turned half of it's thickness into shavings, knots and all. I love this thing. 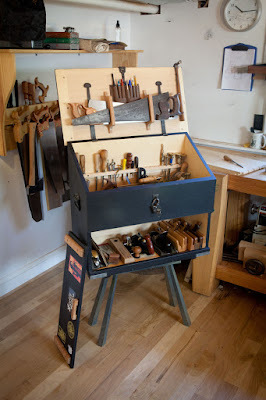 Now speaking of the avalanche, as I made room for my new friend in the drawers of my tool cart, I really settled down to the realization that I need to make the changes to how I store my tools that I mused about several posts ago, with building a hanging tool cabinet and rearranging the Wood Shop Jr. to make it more user friendly. Still I cannot help myself, I love to be the pebble that's responsible for starting the show, but sometimes I get a little tired and wonder if the avalanche will ever stop. Maybe what I need to realize is the avalanche may just be perpetual, and I may forever be just along for the ride. If that's really how it is . . . I guess that will be OK by me, as long as there is some moments of accomplishment along the way. Thank you, that is incredibly interesting, I believe when I picked up this plane online it came to me from California, so at the least from Germany, to California, to Wisconsin. That's an amazing journey. This horn plane is one of my very favorites, the grip is so comfortable and I find myself gravitating to it to solve all kinds of problems.